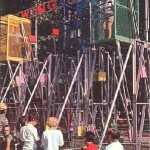 The Swingin’ Gym (also known as ‘The Flying Cages’) has hurt and maimed large numbers of its riders, with the original design almost uninsurable within a few years of operation. 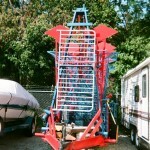 If you own one, you have a giant piece of carnival art, and a great fitness apparatus if you can master it! The ride action is very simple and relies on the physical exertion of its passengers to keep it moving; stopping it is another matter altogether! 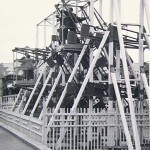 Basically through human strength, a single rider rocks the counter-weighted cage back and fourth until it swings over the top. Within a few years there were all too many reports of riders getting slung over to one side, battered and bruised by their very own momentum with riders sometimes ending up unconscious, with broken bones, split heads, grazes etc. Nevertheless, the ride concept was incredibly original and if not for injuries of lesser coordinated riders, would have been highly profitable and easy to maintain for its owner as the below advertisement suggests. Due to their relatively low cost, many more were manufactured worldwide, with at least 13 units manufactured in the UK, and many more custom-built designs rolled out in a very short time across Europe. A small number of modified units still make appearances across Europe, with enhanced safety including extra padding and supervisor-controlled disc or air brakes in the advent a rider loses their footing. What a conversation piece of backyard play (or exercise) equipment! Swinging Gyms always at Flat rock Indiana VFD fish fry. Held second weekend each year this is the seventh year. 21018 will mark the eighth year. 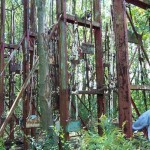 I loved the cages! Was only about 7-8 yrs old and mastered it. Loved to watch big muscle men watch me and think it was easy but then not be able to do it. Was all about balance and weight distribution. 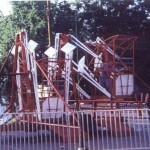 In the early 1970’s, my friend and I were addicted to this ride at the Dade County Youth Fair. We became expert at working it together and we each could swing it over alone. There were 3 different weighted cages as I remember. We were13 at the time. Awesome ride! Best. Ride. Ever. If I had access to one of these, I would throw away every other piece of workout equipment I own. I remember seeing one for sale on Ebay around 10 years ago for about $2k. There are a couple out there for sale now, going for $30k. I could kick myself for not grabbing it back then! My sister & I & friend mastered the swingin’ gym @ Kiddieland on McCormick, Chicago. It took a few trys, dude let us stay on-we went over & over & over again-what a blast! Are there any near Chicago we might ‘re-visit’? I used to run one of these as a Carney in 1974, 75 and 76. I could get over in 4 pumps and used to bet large muscular boys! I would put them in push them, then jump in mine and beat them over the top. I would have their girlfriends hold our money………to embarrassed to argue, good times. Let me know if you have one for sale!! 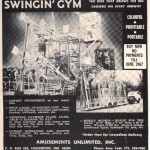 Was there Swinging Gyms at Kiddieland in Melrose Park,Illinois at one time or another?